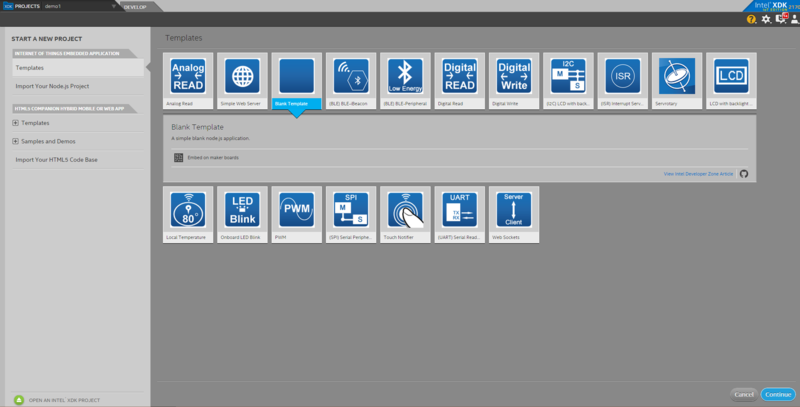 After my brief introduction to the Intel Edison it’s time to get more familar with the platform’s software aspects. I’m going to show how you can start to develop and deploy your ideas, how you can read/write from sensors/actuators and how you can communicate with the Cloud. Giving you what you need to start tinkering and hacking IoT devices. The first thing is to choose your preferred language for the project. To accommodate the needs of more developers, Intel made it easy to use many different programming languages and have provided several SDKs. You can read about all the options in this article. 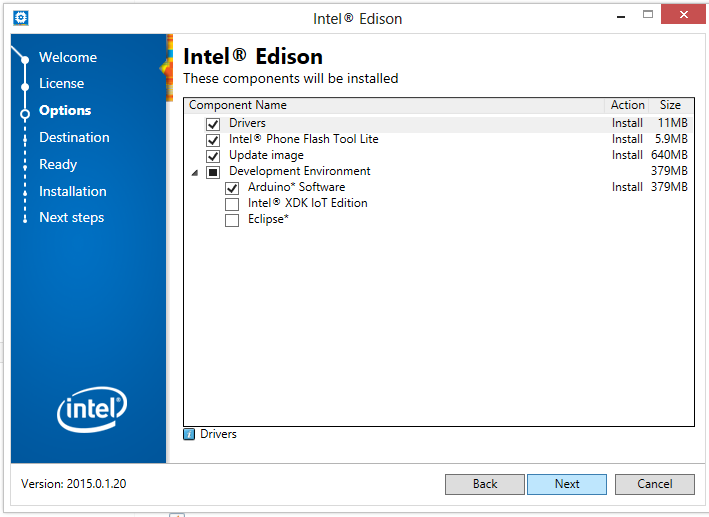 The latest version of the Intel Edison SDK is available through a unified installer that you can get here. Make sure to have a recent version of Java JDK/JRE and continue the installation process. This will install the appropriate driver for the board, updates the Yocto Linux image on the Edison and lets you choose your preferred IDE. The installer is available for Windows and Mac OS, Linux users need to install the preferred IDE separately. Assemble the development board, setup a serial terminal and connect the Edison to WiFi. Make a note about the board IP address, Edison should expose itself via Zeroconf, but we all know that tech doesn’t always work. Now we can configure our IDE. 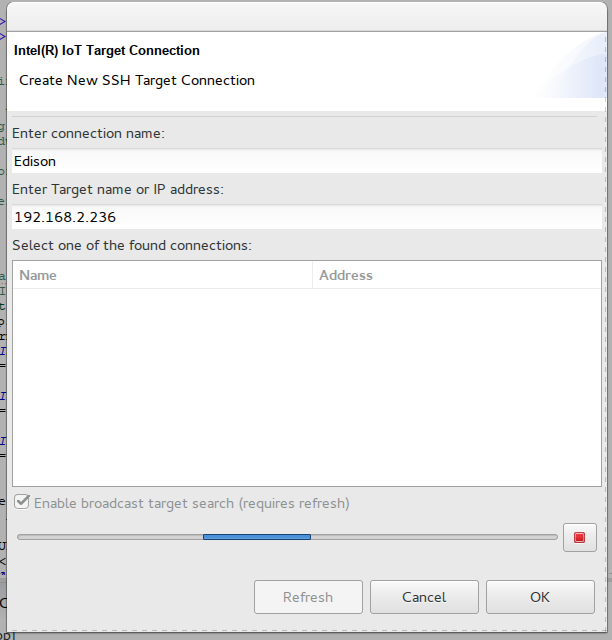 If you are going to develop in C++, open Eclipse and select the IoT DevKit -> Create Target connection item. You should see your board listed, else just enter a name and the ip address noted before. Start XDK and look at the bottom panel of the screen. Click the IoT Device drop down menu and select re scan for device or enter the board ip address as shown below. You should see a success message in the console. 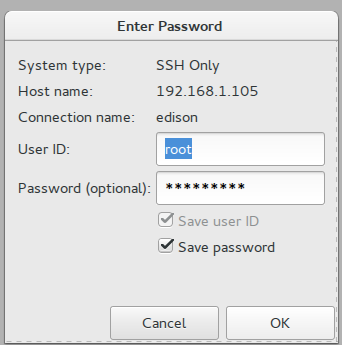 SSH is enabled on the board, so you can skip all the IDE fuss and do everything from the shell if you are more comfortable there. 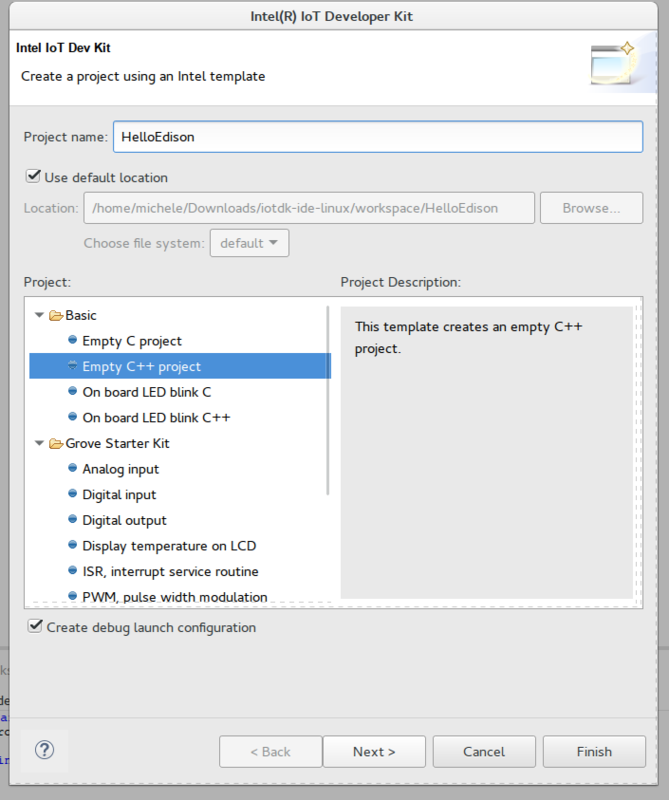 In Eclipse click, IoT DevKit – >Create C++ project and select a blank template. And choose the already defined target. Run the code by clicking the green play button. Eclipse will build the project, deploy to the board and run it. On this first run, Eclipse will ask for the board password. You an follow progress and the application output in the console at the bottom of the screen. 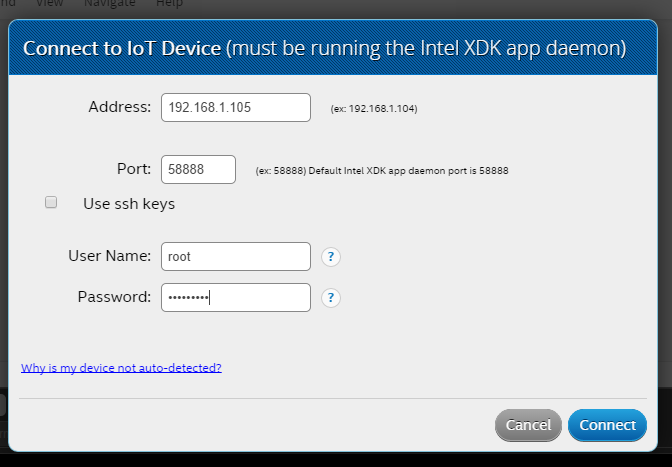 Open XDK, click on the Projects tab, and start a new project choosing the blank IoT template. Use the run button on the bottom toolbar. XDK will ask if you want to upload the updated project, click yes and check the output in the bottom console. One of the great aspects to using the Edison is that there’s nothing new to learn. You can code in your current preferred language, use libraries of your choice, and do whatever you normally do on a Linux system. The main difference is that you can run your project on a tiny device, ready to make wearable or internet things . But we are interested in making something more interesting, taking advantage of the platform’s I/O ability to make things smart. One of my favorite aspects of Edison, is that even a software guy like me can deal with the hardware. Intel provides two useful libraries for this purpose, lib rmaa and lib upm. The first provide an abstraction to the board, so that ports and other hardware features can be accessed through abstract classes without needing to know exact model numbers and data sheet details. It’s time to make something exciting… blink a led! (OK, not that exciting). Now let’s see how we read values from a sensor. In this example I’ll use a temperature sensor attached to the pin Aio 0. Usually, to retrieve the temperature value from a sensor, you read raw values and then check the sensor data sheet, understand the meaning of the raw value and process the value before using it. Now we can combine the above examples and turn on a led only when a predefined temperature is reached. We can show a message on the LCD display with just few more lines of code, using classes provided by Lib UPM. Browse the lib UPM docs to get an idea of supported sensors and actuators and you’ll understand how many things you can use in the same, simple, way. But IoT is about the Internet, so let’s get connected. One of the advantages of the full Linux stack on Edison is that you can use any existing standard library to access the web and all the needed tools to use REST API, xml and json etc are available in a project. These brief examples could serve as a foundation to more complex applications integrating sensors, actuators and the internet. In the next article we are going to build a complete project to show the possibility enabled by this platform and not a lot of code, giving anyone the ability to join the hype of IoT and, have fun in the process.